The Patio is located in the northern Jerusalem neighborhood of Beit Hanina, at walking distance from public transportation to both Old city and Ramallah, West Bank. This is a 2-bedroom suite with its private parking, spacious living room and fully equipped kitchen. The suite is sunny and decorated with wooden frames. The neighborhood is calm and clean. 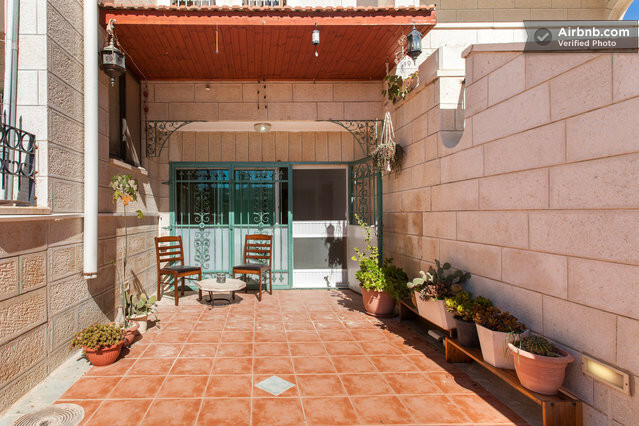 The house is at 2 minutes walking distance to public transportation, and 10 minutes walking distance to grocery & shopping area of Beit Hanina. You will be the guests of a retired couple from East Jerusalem. They speak Arabic, English and Hebrew and are assisted by their sons who speak French and Turkish. The fridge will be stocked with everything you need to make breakfast at your own leisure, including milk, organic eggs, cereal, jam, etc...Other meals can also be arranged.